First published in 1993 this exciting book is now available again and fully revised with color photos and 3D illustrations and cuttaway views. 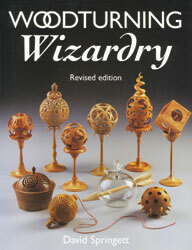 David Springett, a professional woodturner for over 20 years, is known for turning pieces that look impossible to make. He makes Chinese balls, balls inside of balls, cubes inside of spheres, interlocking spheres, lattice lidded boxes, pierced spheres, lattice pomander and more. Detailed Step by step instructions are included for 14 projects of "turned trickery". Introductory chapters include equipment required, wood selection, layout and how to turn the general shapes.